They changed Jewish and world history. OVER TWO DECADES HAVE passed since Anatoly Sharansky, after nine years in a Soviet Gulag penal colony, walked to freedom across Glienicke Bridge that connects Potsdam, in what was then Communist-controlled East Germany, to West Berlin, dressed in a borrowed coat several sizes too large and still defiant - zigzagging precisely because he had been ordered to walk straight. Exchanged on February 11, 1986 for a pair of Soviet spies, stripped of his Soviet citizenship, he was handed over to the American ambassador to West Germany. He was presented with an Israeli passport with his Hebrew name, Natan, and arrived in Israel to a hero's welcome and reunion with his wife, Avital. Now 60, Sharansky has been a politician, cabinet minister, and an adviser to prime ministers (and for several years in the early 1990s a columnist for The Jerusalem Report). Today he is head of the Strategic Studies Institute at Jerusalem's Shalem Center as well as president of Beth Hatefusoth, the Diaspora Museum in Tel Aviv. His 2004 book, "A Case for Democracy," in which he argued that security and peace could only be achieved between democracies, was praised by U.S. President George Bush, who said Sharansky's thinking confirmed his beliefs and was "part of my presidential DNA." But perhaps above all, the Sharanskys have remained the iconic Avital and Anatoly of the struggle for the rights of Soviet Jews in the 1970s and 80s. A one-time member and spokesman of the Helsinki Human Rights Monitoring Group in Moscow, Sharansky made repression of Jewish activists in the Soviet Union widely known to the West. He and Avital were active in the emerging Soviet Jewish consciousness movement, and had applied in 1973 for exit visas to come to Israel. Avital's application was granted, and they married in 1974, one day before the visa expired and she left for Israel. 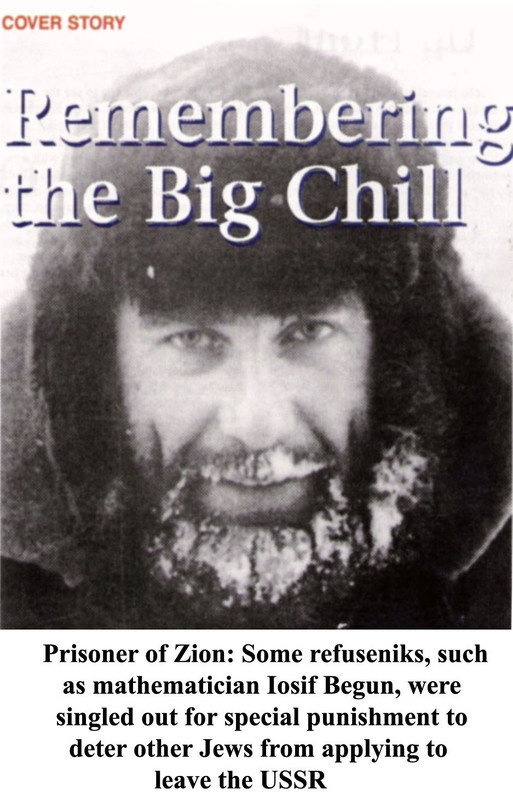 Anatoly was denied a visa for tramped up "security reasons," and thus became a "refusenik" - a term coined by British Soviet Jewry activist Michael Sherbourne referring to a Soviet Jew who was denied an emigration visa. Working with dissident leader Andrei Sakharov and the refusenik movement in Moscow, Sharansky was a thorn in the side of the authorities. In March 1977 he was arrested and in July 1978 convicted on charges of treason and spying for the United States and sentenced to 13 years of forced labor. But inside prison, even more than outside, he focused world attention on human rights violations. It was Avital who deserved much of the credit for marshaling kings, presidents, housewives and students to pressure the Soviet Union to free her husband, the diminutive computer scientist who emerged triumphant from his ordeal with his sense of humor still intact. "Sorry I am late," are said to have been his first words to Avital when the pair were reunited in Israel. In January, 2008, standing beneath his daughter's wedding canopy in Jerusalem, Sharansky remembered his own wedding to Avital, in a one-room Moscow apartment in July 1974. Being in Jerusalem was "just a dream then," he recalled, telling the guests that when Rachel was born, a year after he and Avital were reunited, his late mother, Ida Milgrom "wanted to send her photograph to the world but first to our enemies," his Soviet captors. Many of the guests, including veteran and newer Russian immigrants, Israelis, and visitors from abroad, reflected on just how intertwined are the personal and collective memories of Soviet Jewry and those who supported their struggle. Sharansky's release was "a defining moment for many," which changed world Jewry, summed up Rabbi Shlomo (Steven) Riskin, a co-founder in the early 1960s of the Student Struggle for Soviet Jewry (popularly known by its initials, SSSJ) in New York and, today, chief rabbi of the settlement of Efrat in the Eztion settlement bloc in the West Bank. MUCH HAS CHANGED SINCE those days of struggle. Today, nearly one million Russian-speaking immigrants live in Israel (although a third of them are not Jewish according to Orthodox Jewish law). Daily flights connect Tel Aviv to cities in the former Soviet Union. The Perm 36 Labor Camp in Siberia where Sharansky was imprisoned is now a museum and the "Soviet Jewish national movement," as the struggle is referred to by scholars, is studied in universities and is the subject of scholarly books. But now that the struggle has been won, former activists, historians and educators are concerned that one of the most important and dramatic episodes in Jewish history is being overshadowed. A newly established Public Committee for the 40th Anniversary of the Soviet Jewish Struggle for Aliya, a group of Soviet immigrants chaired by Sharansky, wants to ensure that the valor of a generation of Soviet Jews and their Western activist supporters will not be forgotten. In recent months, the group has sponsored several events, including an exhibit entitled, "Jews of Struggle: the Jewish National Movement in the U.S.S.R. 1967-1989" at Beth Hatefutsoth and a three-day international conference ("Awakening and Struggle") at Jerusalem's Hebrew University. It also sponsored the world premier of "Refuseniks," the two-hour documentary by 34-year-old independent Los Angeles filmmaker Laura Bialis, screened at the Ninth Jerusalem Jewish Film Festival last October. Veteran refusenik, Aba Taratuta, 73, a mathematician and leading Leningrad activist denied (with wife Ida) an exit visa for 15 years, came up with the idea for the exhibit. By 2000, Taratuta, who immigrated in January 1988, and now lives in Haifa, had become troubled that the era had passed with little recognition. With a shoestring budget, he founded the Remember and Save Association, dedicated to preserving cultural material from the movement, such as photos, archival films, Free Soviet Jewry paraphernalia from the protest movement in the West and refusenik art. Storing artifacts in his home and garage, Taratuta approached Beth Hatefutsoth curator Rachel Schnold two years ago, proposing an exhibit. Schnold quickly agreed. Taratuta says he was happy to have Sharansky's high-profile group take charge of the exhibit as part of a wider celebration. Funding for the Committee's events was provided by Israeli-Russian billionaire Leonid Nevzlin, who has established research centers for the study of Russian and East European Jewry in Israel and Russia, and revived the financially flagging Beth Hatefutsoth. Canadian human rights expert, former justice minister and member of parliament Irwin Cotler, who served as a legal adviser for Sharansky's 1978 Moscow show trial, says that the recognition for those involved in the Soviet Jewry movement is long overdue. The movement had an extraordinary "transformative effect" on Jewish, Israeli and non-Jewish world history and changed human rights legislation and terminology, he tells The Report. Solidarity for a just cause, he notes, prompted "a success so enormous," it is hard to appreciate today. In an essay for the exhibit catalogue, British historian Sir Martin Gilbert, who represented the Soviet Jewry cause before the Human Rights Commission in Geneva in 1985-1986, credits the movement with changing Jewish and world history. "It would be hard to exaggerate the importance of the Struggle of Soviet Jewry both in the context of modem Jewish history and the universal history of the Struggle for human rights and dignity," he writes. Western governments too, Gilbert continues, were inspired by the Soviet Jewish sacrifice, prompting solidarity with Jews "that was remarkable in its time, and for all time." ALTHOUGH IN THE WEST, THE Struggle to support Soviet Jewry was born at a 1964 Columbia University rally by the then-nascent SSSJ (which marked its 40th anniversary in 2004), most associate its actual birth with Israel's lightning victory in the 1967 Six-Days' war, which unleashed a surge of Jewish pride in the Soviet Union and stimulated desire to leave for Israel. But Hebrew University historian Dr. Michael (Misha) Beizer, himself a refusenik for seven years, who organized "Jewish tours" of Leningrad for visiting Western activists in the 1980s, says the complex saga of modern Soviet Jewry dates back to the October 1917 revolution. Lenin, fearing that Zionism would distract Jews from the class Struggle, declared the movement bourgeois and reactionary. Hope that a Communist government would be less ruthless to Jews than its Czarist predecessors was soon crushed by the regime's stubborn autocracy, Beizer explains (even though many Jews were high officials in the Soviet hierarchy until the Stalin purges in the 1930s and 40s). In 1947, though the USSR supported the establishment of a Jewish state in Palestine and was among the first countries to establish diplomatic relations with Israel, Jews were "warned" by the government, Soviet-style (through articles in state mouthpiece newspaper Pravda), not to develop any affiliation with the newly founded state. Within a short time of Israel's establishment, the regime unleashed a harsh anti-Semitic campaign including the 1948 murder, on Stalin's orders, of Jewish actor-director and public figure Solomon Mikhoels (in a modern footnote, the exhibit has rare footage of a smiling Mikhoels on a Soviet propaganda trip to Hollywood after World War Ï, a visit which may have set the stage for his Kremlin-ordered murder); a ban on Yiddish culture; secret police-fabricated plots against Jewish doctors and writers; and systematic discrimination in universities and employment. Coming so soon after the hardship of World War Ï (in which an estimated two million Soviet Jews perished), the Soviets thus created the "impassable chasm," says Beizer that would characterize USSR-Jewish relations for the next four decades. Stalin's death in 1953 partially melted hostilities. Under the rubric of family reunification, elderly Jews began to trickle out of the Soviet Union to Israel in small numbers (53 in 1954; 106 in 1955). By 1957, executed Yiddish writers were posthumously cleared of charges of espionage, the Moscow Choral Synagogue was allowed to publish a prayer book and maintain a small yeshiva; and a large Israeli delegation was allowed to participate at the 1957 Festival of Young People and Students in Moscow. Yet even then, as particularly moving footage obtained by curator Schnold shows, Soviet Jews, thirsting for contact with Israel, who tear-fully approached and hugged Israeli participants, were later arrested by Soviet police for initiating contact with foreigners. The exhibit also displays a souvenir cover from the festival with a handwritten Yiddish dedication: "Thank you for the pleasure you gave us." And then the Iron Curtain's gates soon clanged shut yet again and the Kremlin became more obdurate in its opposition to emigration to the Jewish state. Israel's semi-clandestine organization, known as Nativ (its formal name was Lishkat Hakesher, the Liason Bureau) was established in 1952 to keep in contact with Jews behind the Iron Curtain, and would play a major covert role in the Soviet Jewry saga. Among its activities, Nativ encouraged Western diplomats to pepper Soviet leaders with questions about the status of Soviet Jews. Veteran Labor politician Arie Lova Eliav, who served as First Secretary at Israel's Moscow Embassy from 1958-60 and was later head of Nativ, has said in published interviews that his organization chafed under successive Israeli governments that preferred quiet diplomacy with the Soviets - a policy which would later be challenged by American activists. In the early 1960s, Zionist activity continued in the USSR, with persistent Jewish agitation to emigrate and the appearance of Jewish samizdat (underground) publications, which were difficult and dangerous to come by (in part, because copying machines were controlled by the state) and included the Hebrew poetry of Chaim Nachman Bialik and Leon Uris's novel, "Exodus," a near bible for Soviet Jews. A trickle of Jews allowed to leave in the 60s (again, ostensibly for family reunification purposes) was but a tiny fraction of those who wanted to emigrate. The numbers swelled after Israel's crushing victory over the Arab armies in the Six-Day War. The Soviets, patrons and arms suppliers to the Egyptians and Syrians, had branded Israel the aggressor, predicted it would lose the war; and broken diplomatic ties with Israel. Overwhelmed by the victory, Soviet Jewish identity surged and emigration requests rose even higher. In Kiev, Boris Kochubiyevsky penned an emotional essay (which Cotler read aloud at the exhibit's opening night, unaware that Kochubiyevsky was in the audience) entitled "Why I Am a Zionist." Kochubiyevsky was put on trial and jailed for writing the essay, which was published and distributed. By this time, the West was referring to Soviet Jewry as the "Jews of Silence," after the title of the 1966 book on the subject by Elie Wiesel. (Gilbert's 1984 book, "Jews of Hope," underscored the movement's slow but steady progress.) Having openly stamped out Prague's plea for freedom in 1968, the Soviet regime did not hesitate to make a public display of outlawing the teaching of Jewish culture and Hebrew and barring Jews from leaving, notes Gilbert. But the Soviets encountered a new type of Jew who was, among other things, unafraid to demonstrate publicly in the Soviet Union and to be imprisoned, thereby strengthening the movement, says Hebrew University's Dr. Jonathan Dekel-Chen of the Department of Russian and Slavic Studies, organizer of the academic conference. "The Jews created tzores (Yiddish for "trouble") for the Soviets who overreacted and created an even larger monster," he notes. An increasing number of Soviet Jews risked harsh penalties and applied - and were rejected — for exit visas, a policy which generally came with no explanation (refusals were never provided in writing) and a Kafkaesque appeals policy designed to frustrate. Application, even if refused, most often meant loss of job and means of survival, arrest on the charge of "parasitism" and (for young male students dismissed from university) military conscription. Dekel-Chen says the Soviets often attributed a negative decision to state security, claiming that Soviet secrets might be divulged to the West. In August 1969, 18 families from Soviet Georgia sent a collective letter to the Human Rights Commission of the United Nations; to Yosef Tekoa, the Israeli ambassador at the U.N.; and to the government of Israel, demanding the right to emigrate to Israel. "We are not asking for very much - only that they let us leave for the country of our ancestors," stated the letter, which marked the first public demand by Soviet Jews for the right to emigrate. Prime Minister Golda Meir read the text to the Knesset, setting off an intensive international campaign to liberalize Soviet emigration policies. Another letter to U.N. Secretary General U Thant ended with "Israel or death." In July 1971, a group of Georgian Jews held a hunger strike in Moscow. The struggle of the Georgian Jews led to a historic change in Soviet attitudes, and some historians contend that the Jewish emigration activity which took place in the Soviet empire's peripheral states has been underplayed in the 40th celebrations. In June 1970, a group of desperate Jews attracted international attention in an aborted hijacking attempt of an airplane from Leningrad to Sweden. Some refuseniks, such as Sharansky and mathematician Iosif Z. Begun, were singled out for special punishment in order to deter other Jews from applying to leave and were forced to spend years behind bars in penal colonies, Siberian exile or mental institutions. They became known in the West as Prisoners of Zion. Others were "merely" deprived of jobs and subjected to harassment. Premier ballet dancers Valery and Galina Panov (he was Jewish and she was not) who applied for exit visas in 1972 were both denied, promptly fired from their starring positions at Leningrad's Kirov Ballet and then banned from performing altogether. With intense public pressure, the couple was finally allowed to emigrate in 1974 and later divorced; Panov, now 70, still teaches dance in Israel. Beizer points out that the overwhelming majority of the Soviet Union's post-World War II population of an estimated 2.25 million Jews did not risk applying for exit visas to Israel and left only after the collapse of the Iron Curtain in 1991. But a small number did take the risk. According to Beizer, although there are no firm statistics, an estimated 20,000 Soviet Jews requested visas and were denied; "several hundred" of them became Prisoners of Zion. "Their valor has become an integral part of the long story of Jewish resistance," notes historian Gilbert. 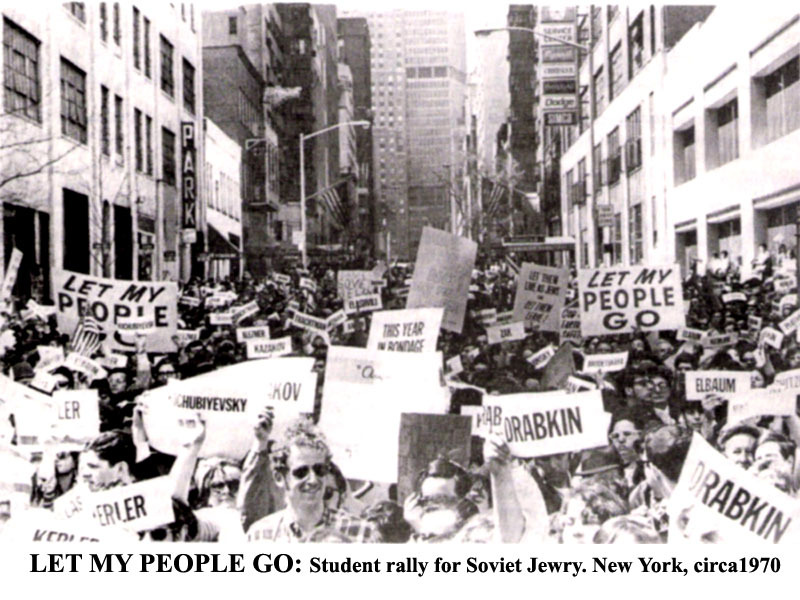 In the meantime, inspired by the American Civil Rights movement and other liberation movements of the 1960s, a grass-roots student campaign in the United States began playing a more active role, raising public awareness of Soviet Jewish suffering through public demonstrations and, later, by lobbying on Capitol Hill to enact legislation linking trade to human rights. In an essay on the role of the international community, Tel Aviv history Prof. Yaakov Ro'i writes that the grass-roots groups prodded the Jewish establishment, still plagued with guilt over a previous generation's inability to save European Jewry from Nazi destruction. When detente was the focus of East-West relations, the Soviets were sensitive to Western pressure, notes Ro'i. Reacting to the increased pressure, and anxious to get rid of their "troublemakers," the Soviets issued more exit permits in the early 70s. But this merely stirred a new generation of activists among the "scientific-technological" intellectuals of Moscow, including Alexander Voronel, Mark Azbel (today both are historians at Tel Aviv University), Sharansky and Begun. A forest clearing several kilometers from Moscow's Ovrazhki railway station became the site for Jewish activists to meet and sing Jewish and Israeli songs - movingly documented at the Beth Hatefutsoth exhibit, as are massive protest allies on the streets of New York and, later, Washington, D.C. In the documentary "Refuseniks," which took five years to make with a budget of $ 1 million (raised mostly by filmmaker Bialis's non-profit foundation), Sharansky recalls how in the :lead-up to his trial, he demanded the right to see footage of Soviet Jewry demonstrations - mainly in order to catch glimpses of his wife, from whom he had, by then, been separated for four years, rallying for his release. Soviet authorities mocked him for believing that a "bunch of students and housewives" could present a serious challenge to the KGB. But historian Gilbert notes that the grass-roots "army" did just that. Wearing T-shirts, bracelets and medallions emblazoned with the names of refuseniks, thousands of people from every walk of life rallied for Soviet Jewry throughout the 60s, 70s and 80s. For many Jews born in the baby-boom years, these protests defined their Jewish and political identities. NEVERTHELESS THERE WERE sharp differences of opinion among Western activists on how to deal with the Soviets. 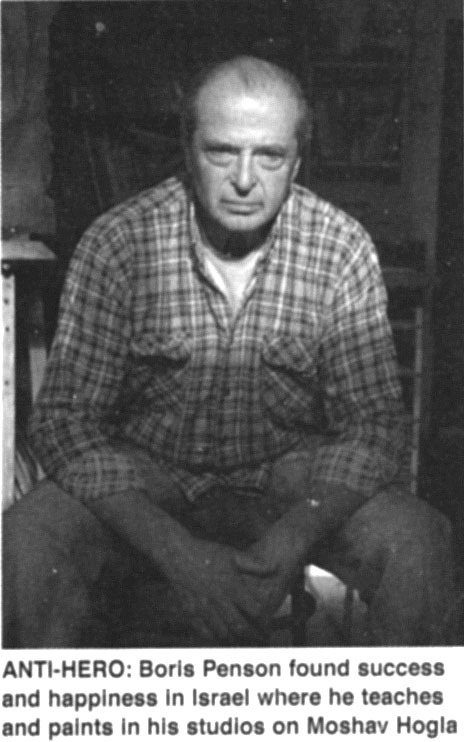 A co-founder of the pioneering SSSJ (with Jacob Birnbaum, Jimmy Torczyner and Art Green), New Yorker Glenn Richter was national coordinator of the group from 1964 to 1990. (The first grass-roots U.S. SJ advocacy organization, even preceding SSSJ, was the Cleveland Committee on Soviet Anti-Semitism established in 1963.) Richter had been a volunteer for the Student Nonviolent Coordinating Committee (SNCC), a civil-rights group founded in1960, after a group of black North Carolina college students refused to leave a Woolworth's lunch counter where they were denied service. He says it was Birnbaum (who ran a civil rights interest group in "Yavneh," the modern Orthodox college social organization), who first highlighted the plight of Soviet Jews. "We felt we should work for our own people's rights. It's a simplistic idea today, but was a leap then," Richter tells The Report. According to Richter, the grass-roots Soviet Jewry movement was often opposed by the Jewish establishment, which started its own "paper" umbrella organization, known as the American Jewish Conference on Soviet Jewry also in April 1964 (renamed the National Conference on Soviet Jewry [NCSJ] in 1971). Unlike the older establishment figures, Richter explains, the SSSJ organizers "didn't have the psychological impediments Holocaust-era Jewish leaders had toward public action, didn't ask establishment permission to act but rather challenged them to do so, and got good publicity." Nor was Nativ "pulling our strings," he says now, adding that in a 1970 visit, Nechemia Levanon, then the director of Nativ, told Richter, "Your problem is that you don't take orders." Richter says that while it is "false to say that the establishment did nothing," he is critical of their underwhelming activity until December 1970, after the first Leningrad trial for the aborted hijacking attempt. Unlike SSSJ, "the establishment had millions of dollars for budgets between them and plenty of staff and simply didn't utilize their considerable abilities for years." He says the establishment was also guided by the Israelis, who tried to maintain tight control of the campaign to free Soviet Jewry, it is widely thought, and probably provided initial funding for the newly reconstituted NCSJ and its New York chapter. But after the Leningrad trial, Richter says the Jewish establishment began to support the idea of large-scale demonstrations, adding that while the Six-Day War made Israel "seem invincible and its guidance sacrosanct," after the 1973 Yom Kippur War, "American Jews didn't see Israel in such a heroic light and the establishment took more independent action, including on Soviet Jewish matters, with the exception of early establishment opposition to the pioneering 1974 Jackson-Vanik Amendment," which tied trade with the U.S. to compliance with basic human rights. Propelled by a desire to influence the Soviet leadership, intrepid students, lawyers, scientists and housewives from North America, Britain and Australia made frequent trips to the Soviet Union, meeting with refuseniks in their homes, distributing objects to sell on the black market and illegal Jewish and Hebrew language study material, and taking out names of the persecuted on scraps of paper for publication in the West. Some such slips were also collected and preserved by Taratuta and are part of the exhibition. "Getting those names out to the West became their life insurance policy," says Enid Wurtman, a prominent American-born activist who lives in Jerusalem today. Others who worked on behalf of the Soviet Jews included Shirley Goldstein in Omaha, Nebraska, whose 1987 "glasnost-shmasnost! summit-shmummit!" jacket hangs in the exhibit; the late Lynne Singer on Long Island, nicknamed the "Yiddishe mama" of refuseniks and Prisoners of Zion for her motherly assistance; New York's Rabbi Avi Weiss, who accompanied Avital Sharansky across North America for three years and chained himself in protest to the gates of the Soviet Embassy in New York; Zev Yaroslavsky (later a Los Angeles city councilman) and child Holocaust survivor Si Frumkin, co-founders of the Southern California Council for Soviet Jewry, who pioneered the tactic of demonstrating at cultural and athletic events where Soviets were taking part and organized impromptu "candlelight walks" for Soviet Jewry, which untapped an outpouring of support and attracted many thousands of torch-bearing Angelenos. Frumkin's group sent one million greeting cards to Jews locked inside the Soviet Union and distributed 200,000 Prisoner of Conscience medallions worldwide. European activists included fluent Russian-speaker Michael Sherbourne of Britain, who famously placed many hundreds of direct calls to refusenik homes, obtaining their urgent news and informing them of protests in the West, and Rita Eker's 35s, also known as the Women's Campaign for Soviet Jewry, a London-based women's group that demonstrated wearing black on behalf of Soviet Jews and spawned 19 branches across Britain, with chapters worldwide. Now 90, a spry Sherbourne attended the exhibit's opening with Richter and many other "stars" of the movement. “ÒÍÅ STRUGGLE FOR SOVIET Jewry changed the discourse on international human rights law,"stimulating new ideas, such as linking freedom of movement and thought to a "new human rights language," including such phrases as "prisoners of conscience," says Cotler. And with his connections to famous human rights activist and scientist Andrei Sakharov, Sharansky linked repression of Jews to the wider dissident movement, ultimately forcing the Soviets to answer to persecution of other religious groups in the USSR, such as the Pentecostals. Cotler cites two pioneering pieces of legislation which came out of the battle for Soviet Jewry: the 1974-1975 Jackson-Vanik amendment to the U.S. Trade Act (over the objections of Secretary of State Henry Kissinger who believed detente was more important than human rights), which required that foreign countries have free emigration as a condition for "most favored nation status" with the United States, and the 1975 Helsinki Accords, which linked border modifications in Eastern Europe following World War Ï to human rights. The Soviet invasion of Afghanistan in 1980, says Beizer, which led to the collapse of detente, also marked the curtailment of emigration and was a period of "mass refusal." Jewish exit visas from 1980-85, dropped to all-time low levels of 800 per year. (In 1979 it had been 50,000.) But the failure of the invasion and the ignominious withdrawal in 1988-1989 was also a prime factor in the ultimate collapse of the Soviet Union. How large a role did the struggle for Soviet Jewry play in bringing down the Soviet empire? Moscow University Prof. Oleg Budnitskii, who attended the Hebrew University conference, tells The Report that while Jews "punched a hole" in the Soviet Union, there were "other factors at play, such as the dying Soviet economy" - increased nationalism among Soviet republics; disenchantment with socialism; and exhaustion from the Afghan military adventure. By the mid-1980s when Mikhail Gorbachev introduced his glasnost and perestroika reforms, he was under pressure to resolve the Jewish emigration issue, says Joshua Rubinstein, director of the Northeast Region of Amnesty International USA, "just as it was necessary for him to release Sakharov and Sharansky in 1986 to convince the world that he was serious about changing his country." In retrospect, says Rubinstein, the Jewish emigration movement, which grew from some 14,000 Jews in 1971 to 187,000 by 1991, the year of the Soviet regime's collapse, "proved to be the most successful organized avenue of dissent" in modern history. And Cotler concludes that the Soviet Jewry struggle movement is "really an amazing story of how just a few people changed the world." And yet, the movement has several unresolved contemporary issues: One is the plight of indigent ex-refuseniks living in Israel today, says activist Wurtman . Like Taratuta (who briefly found work in his field), many spent the most productive years if their lives waiting for exit visas to Israel and “came to Israel too late to get jobs and decent professional pensions. It's wrong," she says. Legislation initiated by Russian-Israeli members of Knesset to give them redress has failed, although Prisoners of Zion who are in particular distress do receive nominally increased government pensions. Another problem is how to preserve and disseminate the refusenik legacy. Member of Knesset Marina Solodkin of the Kadima party acknowledges that many Russian Israelis, particularly of the younger generation "have no idea what the struggle was all about" and are “sadly ignorant” of the heroic role played by some of their compatriots in opening the gates, much as they are about an early generation of Soviet Jewish veterans from World War II. Taratuta says he needs to find a permanent home for his Remember and Save archive. And former refuseniks believe the subject should have a higher profile in Israeli high school curricula. Nor is the jury in on the American piece of the story. Richter, who worked for many years on a tiny salary, then took a job with the New York City Housing Authority, where he works today, says some organizational tensions still linger. SSSJ closed down in 1990 when it was felt that the organization "had accomplished its mission," and donated archival material to Yeshiva University's museum. Activist old-timers still stay in touch via an e-bulletin sponsored by the council union (UCSJ), which exists in diminished capacity. 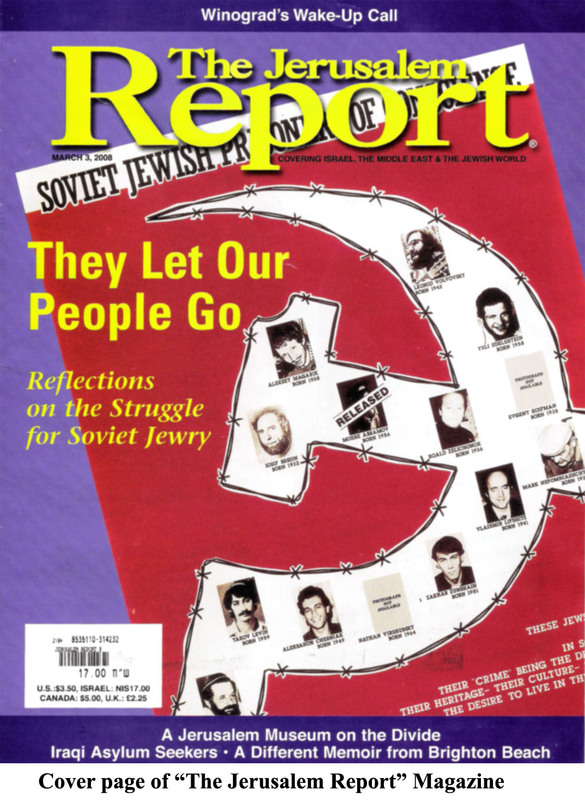 Richter says that a 1999 account of the American Jewish efforts for Soviet Jewry, “A Second Exodus: The American Movement to Free Soviet Jews”, edited by Murray Friedman and Albert D. Chernin, was "largely an Establishment book" and only "after pressure," the authors included a chapter on non-establishment groups such as SSSJ and UCSJ; he says that he hopes that two forthcoming books on American activism for Soviet Jews (by Gal Beckerman and Phil Spiegel) will be more balanced. And yet he maintains that he has no regrets over having spent a lifetime on the barricades for Soviet Jewry. "We were privileged to right the wrongs of relative silence during the Holocaust, to create Jewish history, and not just be bystanders," Richter says to The Report. "I did what any self-respecting Jew would do. They were tormenting us. We fought back," Slepak says with quiet dignity. Speaking to The Report at his cozy home that he shares with his Hungarian-born wife, Julia, and two sons in their 20s, in bucolic Moshav Hogla, near the coastal city of Netanya, he recalls the events now viewed as a turning point in the Soviet Jewry movement. Penson remembers wanting to leave the Soviet Union ever since he was a teenager growing up as an only child in Riga, Latvia, a city with a Soviet-era population of 30,000 Jews. "The country was one big anti-Semitic jail," he says. "It was forbidden to teach Hebrew and Jewish subjects," and despite the Soviet emphasis on the evils of Nazi fascism, the Third Reich's war against the Jews was barely mentioned. For example, says Penson, at Rumbula, a Riga forest where some 35,000 Jews were massacred, a plaque merely noted that innocent Soviet citizens perished there. Penson refused to go along with the Soviet attitude. "My father, as most Jews, knew how to survive. I refused to live my life like that." Emboldened by exit visas for Israel given to two Riga families after the June 1967 war, Penson decided to apply. According to rules established by OVIR, the Soviet agency tasked with processing emigrants, applicants were required to have an invitation from an Israeli relative, known as a visov, requesting family reunification, and a "recommendation" letter from the applicant's employer. Penson received a visov, supplied by the Jewish Agency in Jerusalem, from "Gur Shmuel Tzvi"—someone he never knew or met. After his boss refused to write a recommendation letter, Penson wrote it himself, fabricating unflattering details ("that I was drunk and untrustworthy," he chuckles); they were meant to encourage the authorities to want to get rid of him, but they came to haunt him later. Though as an art student he was not privy to state secrets, Penson was denied an exit visa in 1969 and was promptly expelled from the art academy. Desperate to get out, Penson befriended a loosely organized group of refuseniks from Riga and Leningrad including Yosef Mendelevich, Eduard Kuznetsov (Edik), his then-wife Sylva Zalmanson and her brother Wolf, who "were ready to try anything to leave." An initial plan to hijack a 150-passenger jet was soon vetoed by Mark Dymshitz, a former military pilot who said he would feel unfamiliar at the controls of a modern medium-size commercial jet. Penson says Israeli operatives (from the semi-clandestine Nativ) rejected a hijacking as unrealistic and dangerous. But pressing ahead, Dymshitz soon had his eye on a 12-seater AN-12 plane, which flew passengers, usually hunters, between Leningrad and Sartavala, a town on Russia's border with Finland. The plan called for the plotters to purchase all the seats on the flight with the excuse that they were going to a wedding - hence the mission was dubbed "Operation Wedding." 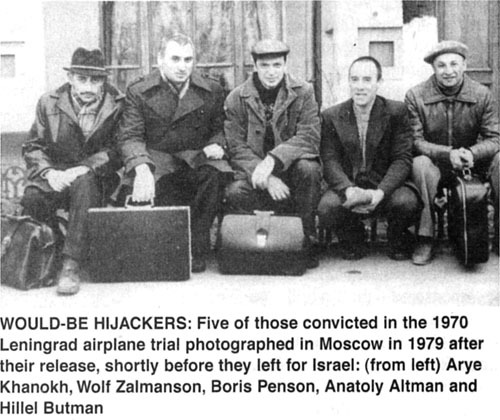 Eight hijackers would board in Leningrad and four (including Penson) would join during a scheduled stopover on a landing strip in the town of Priozersk where the hijacking would take place while the plane was still on the ground. "We brought a tent and vodka for the pilots who would remain behind on the field and we would take off." Dymshitz had just a short amount of time airborne to clear the Finnish border without being intercepted by Russian aircraft and planned to fly on to Sweden (because Finland had an agreement to return defectors to the USSR). Penson says the plane had enough fuel for the four-hour flight. Penson traveled to Leningrad bó train two nights earlier, spending one night in Priozersk with Sylva Zalmanson, Aryeh Khanokh, and his pregnant wife Mary. Khanokh insisted upon bringing along a heavy valise to the hijacking, giving the mission a bumpkin-like quality. "We were furious at him. But he thought he was making aliya and took all kinds of stuff," Penson laughs. But the would-be hijackers never made it into the air. Penson's group was arrested first. In hindsight, he says, the mission was hampered by lack of communication between the two groups of hijackers and an underestimation of KGB surveillance, which had pãîbàbló started after the conspirators had applied for exit visas to Israel. "It might have worked had we not applied." At the December 1970 trial in Leningrad, participants were charged with treason and intent to commit theft of national property (the plane) in excess of 62,000 rubles - both punishable bó death. No mention was made of being denied exit visits to Israel but Penson's self-besmirching fake letter was introduced as evidence. Kuznetsov and Dymshitz received the death penalty, commuted to 15 years in jail. Penson received 10 years at hard labor. Only Mary Khanokh did not receive a sentence because of her pregnancy. "The Soviets used her condition to show they were humane," says Penson. The Leningrad trial made waves around the world. Penson says theirs was the first internal hijacking ever attempted in the USSR and "we were portrayed as criminals in the Soviet media." In jail they were hailed as heroes by Latvian fascists still serving sentences for World War II crimes. "They admired us for standing up to the Soviets," and secretly provided them with fresh tomatoes from the prison garden. The case was the first nail in the Soviet coffin, says Penson. It signaled to the Soviets, he says, that a "new generation of Jews had grown up after Stalin and we weren't afraid of the authorities." Veteran Prisoner of Zion Iosif Begun says the hijacking attempt electrified Soviet Jews. "It was totally heroic and we had the greatest admiration for them," he tells. The Report. Sharansky helped widowed Gesia Penson, Penson's late mother, organize a campaign for her son's release until she was deported from the Soviet Union. (Mother and son were reunited in Israel.) In the West, the hijacking attempt, in which no one was hurt, galvanized popular Jewish support for Soviet Jewry. Days before the trial, SSSJ held a rally that filled New York's Madison Square Garden. Penson remembers that, during his nine years in Soviet jail, "our morale was high because we believed that what we had done was not in vain. The gates were opening... the Jackson-Vanik amendment was on the table... things were happening." Penson and the others were released in a spy swap in 1979, a year (for him) ahead of schedule. "The next time I ran into Dymshitz and Kuznetsov was in the United States Congress." Penson found success and happiness in Israel where he teaches art and paints in studios erected on his Moshav Hogla property. He resists the "hero" appellation, modestly saying Israel is filled with Holocaust survivors and that his many years in Soviet prison, however filled with agony, do not compare "with a minute in Auschwitz." Nevertheless he finds it upsetting that former Prisoners of Zion are rarely invited to tell of their sacrifice to students or soldiers as are Holocaust survivors, and it is for this reason that many Russian Israelis are unaware of the Soviet Jewry movement. Yet Penson says has no regrets. "Anything was better than suffering humiliation for being a Jew in the Soviet Union. We had no choice." And that message "of simple pride in being a Jew," is worth passing on, he says. 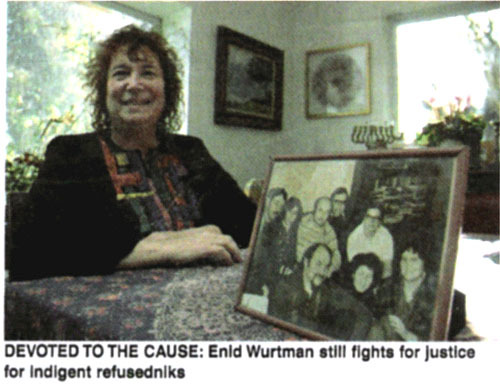 ENID WURTMAN, 65-YEAR-OLD JERUSALEM GRANDMOTHER of four, born and raised as a "serious Conservative" Jew in Brooklyn, New York, says the problems confronting Soviet Jewry didn't really "cross her mind" until 1973, when she and her lawyer husband, Stuart, traveled on an organized eight-day trip to Russia, sponsored by the Happy Holiday Tour Club, an American travel company. Wurtman went with the "vague hope" of helping Soviet Jews. By the time she came home, "our lives were never the same." At one point the couple would co-chair the Union of Councils for Soviet Jews, the largest independent (non-establishment) Soviet Jewry organization in the U.S. with 100,000 members in 40 cities. Deeply moved by encounters at the homes of refuseniks such as Yuly Kosharovsky (denied an exit visa for 18 years), whom she met outside Moscow's main synagogue, Wurtman, like other Western activists devoted decades to the cause of Soviet Jewry, eventually making aliya herself in 1977, with her husband and young sons; a daughter was born in Israel. "We were so impressed by the courage of the refuseniks who risked arrest just for wanting to move to Israel. How could we not go?" Returning from her 1973 trip imbued with "a huge sense of responsibility" toward refuseniks who lacked Jewish study materials and financial means and were worried that they would be forgotten, "Stuart and I lectured day and night to get the story out." They made subsequent trips in 1974 and 1976 when Wurtman met with veteran academic refuseniks, including Slepak, Alexander Lerner, Sharansky, Ida Nudel and Dina Beilin. "It was the height of the Cold War, nothing was budging." Back home, Wurtman's Lower Merion, Pennsylvania synagogue adopted Kosharovsky - a solidarity model soon copied by other communities.